Now we are still 4 days out, so its nearly impossible to pin down specifics such as snow totals, icing, and severe weather. 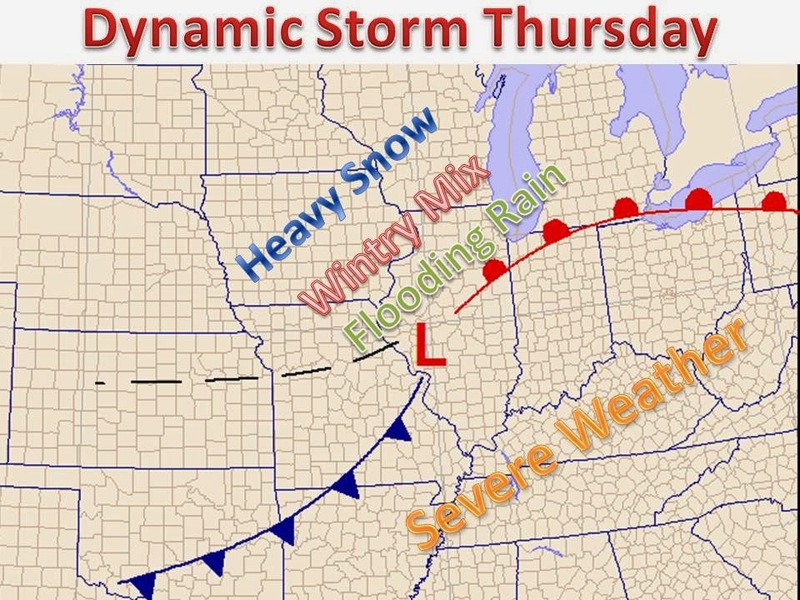 However, a major storm is on the way Thursday. A clashing of Spring and winter in the midsection of the United States. We will see everything from heavy snow (maybe 6"+) to possible icing, flooding rain on the order of 1"+ over a deep snow pack, not to mention a widespread severe weather outbreak is looking very likely. As always, it will really depend on the specific track of the system to understand who gets what. The map on the left will give you a general idea. Be sure to stay tuned for updates as this major event gets closer. In the meantime enjoy the above normal temperature area wide through the end of the week.